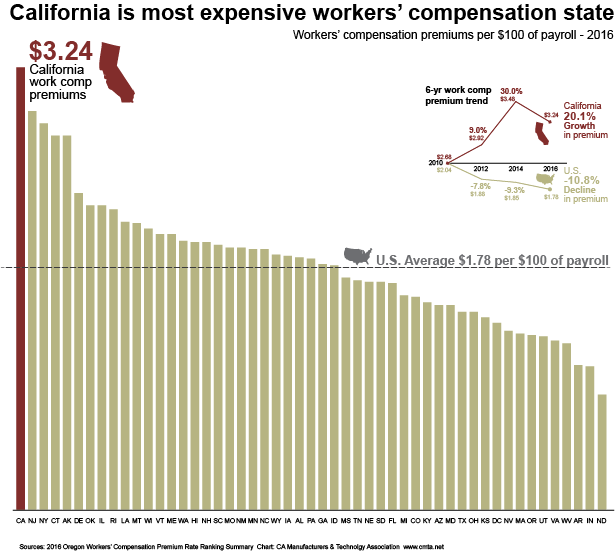 Unfortunately for California manufacturers, our state continues to be the most expensive state for workers’ compensation insurance rates at an average $3.24 per $100 in payroll. While rates are trending downward according to the Oregon Workers' Compensation Premium Rate Ranking Summary, California's decline is not occurring quick enough or deep enough to level the playing field, despite the reforms in 2012. Here's a look at the prmeimus by state with California's trend vs. the national average.